In 1604, Raphael Symonds, gentleman, the Warden of Sutton Coldfield (equivalent to Mayor), issued a deed of proclamation on behalf of the Corporation, effectively a lease. The Latin deed says - Know ye that we have granted to George Pudsey Esq. full power and authority to erect in certain common marshy lands called Lyndryche Coppice banks and dams for a pool…paying an annual rent of five shillings and fish to the value of one shilling and sixpence. This was Langley Mill Pool, which lies between Lindridge Road and the M6Toll. Ninety-three years later, when William Jesson Esq. had succeeded the last of the Pudseys to the Langley estate, the Corporation made another grant of another piece of the commons so that another pool (Lindridge Pool) could be made. This later lease mentions the earlier deed, describing the pool created in 1604 as being “near to the Mills called Langley Mills for the use of the said mills”. The wording of 1697 deed implies that the 1604 pool was made near to Langley water mill, which was probably built in the 1580s. The tiny stream through Lindridge Coppice would dry up to a trickle in dry weather, and the creation of a reservoir to store water for later use by the mill seemed a good proposition. But the mill could not be used while the pond was being fished, and the when the mill was in use the fish in the pond “smother” says the 1697 deed, “both which inconveniences may be prevented by making another pool at the Tayl or End of the said Old Pool to contain water during the fishing time and immediately after to refill the old pool again and be no prejudice to any person whatsoever”. The deed goes on to grant liberty and authority to make a new pool of the same size using turves and soil from the commons, the lease being for 1,000 years at three shillings per annum and a dish of fish and six bottles of wine. There is a note on the reverse side of the parchment to the effect that the wine and fish were only payable “when the new pool shall be fished by drawing down and drayning the said pool upon Solemn and public fishing thereof and not upon any private fishing”. Today you can see anglers sitting patiently beside the pool all day long - the “public fishing” may have been unsportsmanlike, but it was surely more effective. In 1786 William Marigold was the miller at Langley Mill, being admonished to ‘grease the wheel of the new chair often’ - this instruction comes from a letter written from Glasgow by the Rector of Sutton to his wife, in which he also asked for the ‘bolt’ to be delayed until his return. This bolt would have been the draining of the pool and a ‘public fishing’, which must have been a popular event. However, by 1835 the Langley estate was in decline, the mill had not been maintained, and it was no longer grinding corn. 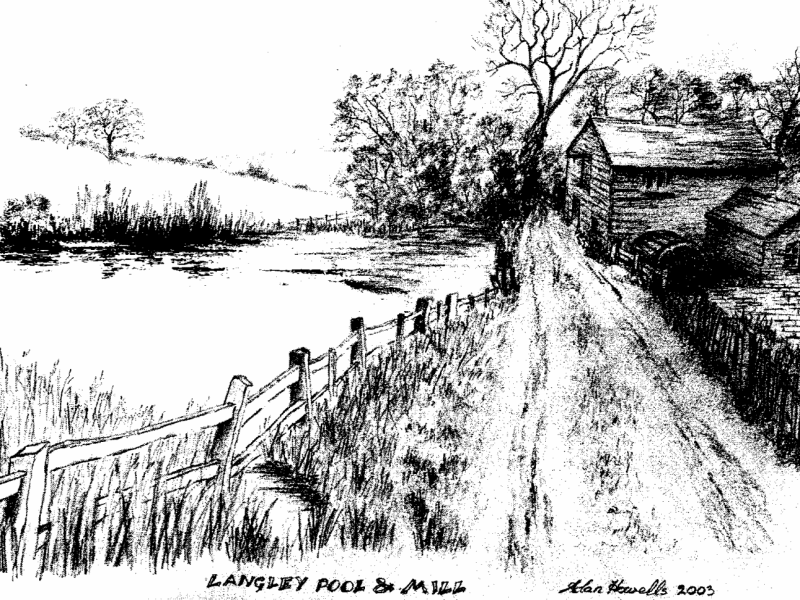 Langley water mill, as envisaged by Alan Howells.